Arts In Action » Time to Appreciate Your Web Designer! This weekend I had the honor and privilege of working with Phoebe Ezell, the world’s most amazing website designer! We created a one of a kind website for Arts In Action…A gift to my clients, students and colleagues as we plan to offer loads of freebies and updates on the trends and happenings of tax-exempt businesses. Welcome to our community! Phoebe! You are one cool chick! 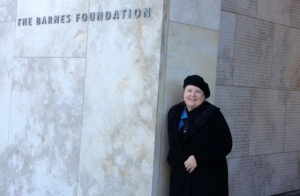 We even had some time left over to visit the Barnes Foundation’s Fine Art Collection in Philadelphia.